Download "NON-MANAGEMENT AGREEMENT (LEASE ONLY) AND EXCLUSIVE RIGHT TO LEASE"
1 NON-MANAGEMENT AGREEMENT (LEASE ONLY) AND EXCLUSIVE RIGHT TO LEASE THIS AGREEMENT between (Manager) and (OWNER) is entered into this day of, 20 and the parties agree as follows: 1. EXCLUSIVE RIGHT TO LEASE: Manager shall have the exclusive right to lease the real property described as and located in the City of, County of, State of Florida, Zip Code. 2. RIGHT TO LEASE: Owner certifies and represents that the person herein described as Owner has the legal authority and capacity to lease the property, and the property to be leased is a legal unit(s) and rental of same will not violate any laws, ordinances, or rules. Proof of ownership shall be furnished to Manager by Owner (Warranty Deed or HUD Closing Statement). Property is Listed for Sale Yes No 3. LEASE TERMS: Owner authorizes and agrees that Manager may offer the property for at the following terms: Maximum Lease Term of months Minimum Lease Term of months Rent Range of $ to $ per month Last Month s Rent of $ prior to Tenant s Occupancy Security Deposit of $ prior to Tenant s Occupancy In addition to the monthly rental amounts, Tenant shall pay a sales tax at the prevailing rate (if applicable) to the Manager for payment to the taxing authority: for rentals less than 6 months and 1 day. 4. DISPOSITION OF DEPOSITS: Manager shall collect deposits and first month,s rent from Tenants at the time of lease signing. Last month s rent and security deposit shall be forwarded to Owner for deposit in a separate bank account as required by Florida Statute. The first month s rent shall be retained by Manager as set forth in Article 5, following. 5. LEASE COMMISSION: Owner agrees to compensate Manager in the amount of 100% of amount equal to one full month s rent. Compensation shall be due to Manager at the time lease is signed by Tenant and funds are paid to Manager. 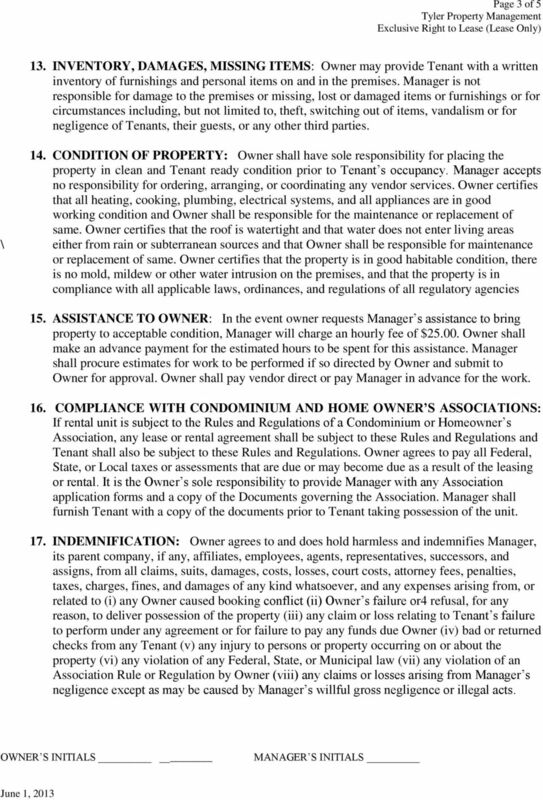 Manager shall retain the first month s rent as set forth in Article 4, above. Owner s termination of this Agreement for any reason or Owner s default under this Agreement does not cancel compensation due Manager. A subsequent breach or failure to perform by Tenant shall not entitle Owner to a refund of all or part of the fee set forth herein. Manager does not guarantee any Tenants performance under any lease. Owner shall pay Manager a non-refundable marketing set-up fee of $ on date of this lease. 6. LEASE DOCUMENT PREPARATION FEE: Owner agrees to pay a fee of $35.00 to have an Attorney prepare the initial lease and for subsequent lease renewals. 2 Page 2 of 2 7. TERM OF AGREEMENT: Owner grants to Manager the exclusive right to lease the property for a term of months from the date of this Agreement. Owner and Manager have the right to immediately terminate this Agreement, without cause, at any time upon written notice. Such termination shall not relieve the Owner from its obligation to pay any amounts due Manager under this Agreement. If terminated by Owner, Owner agrees to pay Manager the sum of $ in addition to any amount otherwise due. 8. AUTHORITY TO LEASE: Owner agrees to promptly refer to Manager all inquiries that concern the rental of this property during the term of this Agreement. Owner expressly grants to Manager the authority to negotiate leases and lease renewals and agrees to accept a lease that satisfies Manager s criteria. Tenant may not take possession of the property until a fully executed lease has been delivered to Manager complete with Owner s signature. Owner may return lease to Manager by or facsimile. If Owner is not available to sign the lease within 24 hours, Manager may sign for Owner and such signing will be as if Owner has signed the lease. In the event that a prospective Tenant places a deposit with Manager or Owner and the prospective Tenant does not sign a lease, the deposit, if retained, shall be disbursed 50% to Owner and 50% to Manager. 9. MANAGER OBLIGATIONS AND AUTHORITY: Manager agrees to make diligent and continued efforts to lease the property. Owner authorizes Manager to: a) advertise the property as it deems advisable, at its sole discretion on commercial websites, company website, print media b) place appropriate signs on property and remove all other signs, including Owner s, during the term of this Agreement.  Such advertising may be general in nature and may not specifically describe the property. 10. SECURITY DEPOSIT AND ADVANCE RENT: All security deposits and advance rents will be collected by Manager and forwarded to Owner within 5 days of collection. According to Chapter 83 of the Florida Statutes, all deposits must be deposited in a Florida bank, in a separate account and disbursed according to law. 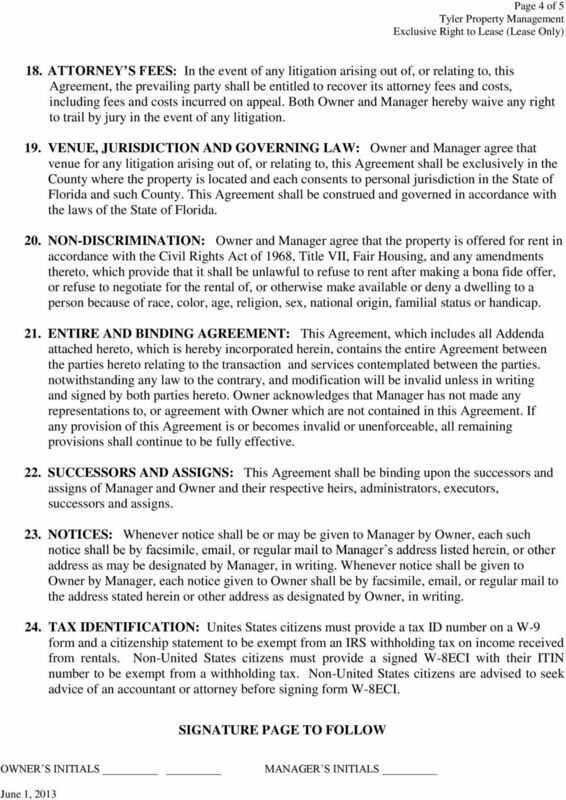 Owner shall indemnify Manager in the event Tenant sues Owner or Manager over a dispute concerning the security or advance rent deposits. 11. TENANT HISTORY: Manager shall obtain a standard credit and background report (Tenant Report) on all Tenant applicants from a source of Manager s choosing unless said Tenant Report is waived by Owner in writing. Owner agrees and understands that the Manager will also confirm that prospective Tenant is employed as claimed by prospective Tenant. Owner agrees that, upon request, Owner may be furnished the Tenant s background information, but will not be furnished the credit information. If the applicant fails to meet the Manager s criteria for rental, Owner can override this by signing an Owner Authorization to Rent Form. 12. KEYS: Upon execution of this Agreement, Owner shall furnish to Manager 3 sets of keys for each door lock, security and pool keys (if applicable), mailbox keys, garage door openers, gate cards or combinations. Owner authorizes Manager to deliver applicable keys to tenant at time of Tenant s possession of property. 3 Page 3 of INVENTORY, DAMAGES, MISSING ITEMS: Owner may provide Tenant with a written inventory of furnishings and personal items on and in the premises. Manager is not responsible for damage to the premises or missing, lost or damaged items or furnishings or for circumstances including, but not limited to, theft, switching out of items, vandalism or for negligence of Tenants, their guests, or any other third parties. 14. CONDITION OF PROPERTY: Owner shall have sole responsibility for placing the property in clean and Tenant ready condition prior to Tenant s occupancy. Manager accepts no responsibility for ordering, arranging, or coordinating any vendor services. Owner certifies that all heating, cooking, plumbing, electrical systems, and all appliances are in good working condition and Owner shall be responsible for the maintenance or replacement of same. Owner certifies that the roof is watertight and that water does not enter living areas \ either from rain or subterranean sources and that Owner shall be responsible for maintenance or replacement of same. Owner certifies that the property is in good habitable condition, there is no mold, mildew or other water intrusion on the premises, and that the property is in compliance with all applicable laws, ordinances, and regulations of all regulatory agencies 15. ASSISTANCE TO OWNER: In the event owner requests Manager s assistance to bring property to acceptable condition, Manager will charge an hourly fee of $ Owner shall make an advance payment for the estimated hours to be spent for this assistance. Manager shall procure estimates for work to be performed if so directed by Owner and submit to Owner for approval. Owner shall pay vendor direct or pay Manager in advance for the work. 16. COMPLIANCE WITH CONDOMINIUM AND HOME OWNER S ASSOCIATIONS: If rental unit is subject to the Rules and Regulations of a Condominium or Homeowner s Association, any lease or rental agreement shall be subject to these Rules and Regulations and Tenant shall also be subject to these Rules and Regulations. Owner agrees to pay all Federal, State, or Local taxes or assessments that are due or may become due as a result of the leasing or rental. It is the Owner s sole responsibility to provide Manager with any Association application forms and a copy of the Documents governing the Association. Manager shall furnish Tenant with a copy of the documents prior to Tenant taking possession of the unit. 17. INDEMNIFICATION: Owner agrees to and does hold harmless and indemnifies Manager, its parent company, if any, affiliates, employees, agents, representatives, successors, and assigns, from all claims, suits, damages, costs, losses, court costs, attorney fees, penalties, taxes, charges, fines, and damages of any kind whatsoever, and any expenses arising from, or related to (i) any Owner caused booking conflict (ii) Owner s failure or4 refusal, for any reason, to deliver possession of the property (iii) any claim or loss relating to Tenant s failure to perform under any agreement or for failure to pay any funds due Owner (iv) bad or returned checks from any Tenant (v) any injury to persons or property occurring on or about the property (vi) any violation of any Federal, State, or Municipal law (vii) any violation of an Association Rule or Regulation by Owner (viii) any claims or losses arising from Manager s negligence except as may be caused by Manager s willful gross negligence or illegal acts. EXCLUSIVE PROPERTY MANAGEMENT AGREEMENT Long-term Rental Property This Exclusive Property Management Agreement is entered into by and between and Carolina Realty of Chapel Hill, Inc. ("Owner") ("Agent"). LEASE - MANAGEMENT AGREEMENT THIS AGREEMENT is made and entered into this (DATE) and between (hereinafter referred to as "Owner") and EW Capital Management LLC_(hereinafter referred to as Lease Manager). Page 1 of 5 Selling Office: Selling REALTOR : Selling REALTOR s Email: Selling REALTOR s Phone: Listing Office: Listing REALTOR : Listing REALTOR s Email: Listing REALTOR S Phone: Date:, 20 at AM PM 1. 1. DATE AND PARTIES This agreement, dated, 20, is between:, from now on called LANDLORD,, from now on called TENANT(S).